Throughout the centuries jewelry has been created and worn by people of different cultures. 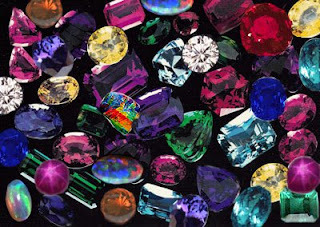 Every culture had it gemstones that they valued and they attributed a special meaning to each. Today the list of precious and semi-precious gemstones is very large and each one has a history and folklore associated with it. The Quality Jewelry Directory has created a list of the most popular gemstones and gives a brief outline of each. Alexandrite: One of the most valued and sought after gemstones is Alexandrite. Born in metamorphic conditions that bring together specific chemical elements to produce the mineral chrysoberyl, the gemstone has been valued by jewelers throughout the ages for its unique ability to change color from green to shades of red or very soft purple when exposed to daylight and incandescent light. Russia is the primary source for most gem quality alexandrite and was named after the Russian Tsar Alexander II. With a rich folklore history, alexandrite was thought to impart wisdom, creativity and to strengthen a individuals insight. Listed on the Mohs Scale of Hardness at 8.5, it is a perfect gemstone to design into high quality jewelry. Ruby: Ruby is a beautiful gemstone that is part of the mineral family corundum. Corundum is found within crystals of metamorphic rock and is considered to be the second hardest mineral next to diamonds. Corundums come in different varieties and can be considered a sapphire in different colors. Some of the best rubies are in true red and come from Burma. They can also be found in other areas throughout the world, such as Australia, Kenya, Pakistan, Sri Lanka and the United States. With its well known sturdiness, it makes a perfect gemstone for jewelry. Often set with sapphires and diamonds, it is a perfect stone to pair up. The ruby was thought to have mystical powers and was often worn as a Talisman to ward off great evil. The ruby's color was often associated with blood and was thought to have the ability to stop bleeding and to heal ailments associated with it. Sapphires: Sapphires belong to the mineral family of corundum and are found in weathered alluvial deposits from pyroclastic flows. Most sapphires are blue stones which range from slight blue to a deep indigo coloration. The most valued of the sapphires are ones that have the medium blue coloration and these are referred to "cornflower blue". Sapphires come in many colors and these are often called "fancy sapphires". Only in the case of red, are corundums called rubies. Sapphires are found throughout the world but primarily in Australia, United States. Sri Lanka, Thailand, Burma, Kampuchea, Kenya and Tanzania. The name "sapphire" comes from multiple sources. In Persian, it is "safir" and was associated with Saturn. In Latin, "sappheiros" for the island where sapphires were mined. Ancient folklore is rich with stories related to sapphires. Seen as a stone that changes its hue when the wearer was engaged in impure behavior, it was given to the wearer to help impart fidelity. Also thought to bring inner peace to the soul and spiritual enlightenment. Amethyst: Amethyst is a purple colored gemstone that is from the mineral "quartz" and derives it beautiful purple color from the iron impurities within the crystal. Throughout the world, amethyst is primarily found in Mexico, Brazil, Canada, Uruquay, Madagascar and Australia. Amethysts occur as long prismatic crystals that form six-sided pyramids end to end and grow in druzes within crystalline crusts or in sandstone formations. Amethysts are believed to bring the power of peace and calm and are often used in meditation. Due to its rich color and calming effects it is used to relieve stress from every day work and to relieve headaches due to tension or migraine headaches. Amethyst is often seen to encourage deeper understanding, encourage love and awareness. Amethyst was often worn to bed to produce and encourage peace and beautiful dreams. Amethysts are adorned in some of the richest displays of jewelry such as the British Crown Jewels. Catherine the Great was very fond of amethyst as were the Egyptians. Pearl: Pearl is the modern birthstone for the month of June. The beautiful pearl is the only gem that is created from a living organism, the oyster. The process of pearl formation is actually a reaction to an irritant within the oyster itself. This irritation causes a material called nacre to envelope the irritant and over time creates a beautiful pearl. Pearls come in different varieties such as cultured pearls, freshwater pearls, tahitian pearls, black pearls. Other varieties of pearls are barogues which display an irregular appearance and Mabe pearls that are cultivated blister pearls. The name "pearl", comes from the latin word, "perula" or small pear. The Chinese were the first to cultivate pearls in saltwater, but over the years they were cultivated in saltwater and freshwater alike. Today, some of the finest cultivated pearls come from Japan. Pearls are associated with purity, wisdom through experience and perfection. Emeralds: Emeralds are actually the green version of the mineral beryl. This type of beryl contains small amounts of chromium and iron which give them their unique color. Emeralds are commonly found in sedimentary rock that has undergone changes in temperature and pressure. Emeralds can be found in the Russian Federation, United States, Pakistan, Norway, India, Malagasy, and Australia. Some of the best emeralds are found Colombia and these crystals exhibit the best quality for their size. The name emerald comes from the Greek term "smaragdos", which loosely translates to "green gemstone". The quality in the emerald is determined by it's clarity and it's deep grass green coloration which exhibits a slight hint of blue. Emeralds have a deep history and folklore. The history of emeralds can be traced to the ancient Babylonians and the Egyptians where tools have been found in ancient emerald mines where the Queen Cleopatra's emeralds originated. The Incas also mined emeralds and the largest and highest quality stones were once worn by nobility. Unfortunately, many emeralds were lost to time, due to invasions, greed or through the inclusion of these gems in private collections. Diamonds: Diamonds are the hardest known natural material and have other qualities that make the diamond a true king of gems. Based upon the element "carbon", diamonds are actually similar to graphite, but like carbon they have a unique crystalline composition. The dense atomic structure of diamonds makes them extremely valuable in jewelry but also in modern day industrial applications. Diamonds are formed deep underground where pressure and temperature are critical for their formation. In ancient times, India was the only known source of diamonds, until after the 1800 century, deposits were discovered all over the world. Diamonds come from a variety of sources but the primary deposits are from large openings in the Earth called volcanic pipes. These are often called kimberlite pipes. The vast majority of all diamonds originate in Africa but other significant finds have been discovered in Russia and in the northwestern territories of Canada. Turquoise: One gemstone that is very popular is turquoise. Turquoise is a copper aluminum phosphate mineral that is found in locations that have high concentrations of copper. Turquoise is created from a variety of natural process and is found in areas that are arid in climate. These climate conditions are important in weathering and oxidation of copper deposits and producing the conditions that support the creation of turquoise. Turquoise can also be created from hydrothermal actions, leaching and precipitation of surrounding copper deposits to form turquoise. Turquoise comes in variety of shades such as blue-green, and green with flecks of gray with traces of iron and chrome. The best quality turquoise is "sky blue" or often called "robin egg" blue. Turquoise is found throughout the world, but comes primarily from the United States, Iran, Afghanistan, China and Mexico. Topaz: Topaz is a silicate mineral that has been used as a gemstone for centuries. Topaz is considered the hardest of silicate minerals but has interesting properties that make it similar to diamonds in its ability to be cleaved into smaller increments. Unlike diamonds, the crystals of topaz can come in very large sizes. Topaz is usually found in pegmatities, quartz veins and inside of granites and rhyolites. Topaz in its true form is clear, but can come in a large assortment of colors due to various impurities within the crystal lattice. These colors can range from red, green, orange, brown and yellow. Topaz in its natural state forms short or long multi-faceted crystals and is prized as a mineral specimen in its natural state. Topaz is located throughout the world but is primarily found in Russia, Australia, Africa, Mexico, Brazil and Pakistan and some of the best quality and prized topaz deposits are found in Brazil. Certain regions of the United States have topaz deposits, most notably in San Diego County and the Thomas Mountain Range in Utah which is renowned for its beautiful blue topaz. If you are shopping for jewelry look to the Quality Jewelry Directory to help you find what you desire. Additional information can be found in other areas of our website: Gemstones, Jewelry Cleaning, Birthstone information and Anniversary Stones. The above list is small breakdown of each gemstones history and folklore. The list is not intended to be the end all of gemstone information and should not be looked upon as such. Each gemstone has it's own mineral data, history and folklore and all data cannot be written about each one. It is recommended to seek other websites for deeper knowledge on each.